JNN 11 Apr 2015 Sanaa : Shia Houthi fighters and allies enter provincial capital of Shabwa province, the economical Hub of Yemen , Rich in Natural Resources especially Natural Gas , despite intense Saudi-led air strikes , which has already Killed 643 Innocent Yemeni People . Houthi fighters, backed by supporters of former Yemeni President Ali Abdullah Saleh, have entered the provincial capital of the Shabwa province in eastern Yemen, despite intense Saudi-led air strikes against the group. Residents said local tribal chiefs and security officials facilitated and welcomed the entry of the Houthi forces to the city of Ataq on Thursday, where they took control of the offices of the local government and security forces compounds. It was the first time that the Houthis and their allies had entered the city, bringing them closer to the country’s most prized economic asset, the Belhaf natural gas facility and export terminal, on the Arabian Sea about 160 km to the southeast with out any resistance . Saudi Arabia, backed by four Gulf Arab states and other regional Arab allies, has mounted two weeks of air strikes against the Houthis, who have since pushed south towards Aden, the stronghold of Saudi-backed Yemeni President Abd Rabbu Mansour Hadi. The air campaign failed to stop the Houthis and soldiers loyal to Saleh entering central Aden, but the coalition still claiming that it has cut Houthi supply lines, destroyed weapons depots and pushed them back in some southern provinces around Aden. Meanwhile, the World Health Organisation (WHO) says at least 643 people have died and more than 2,200 have been injured in the conflict so far. Tens of thousands of families have also been displaced and the WHO has warned that the situation in the Arabian Peninsula nation is critical. In a speech on Thursday in Tehran, Iran’s President Hassan Rouhani called for an end to the air strikes in Yemen, saying countries in the region should work towards a political solution. “A great nation like Yemen will not submit to bombing. Come, let us all think about ending war. Let us think about a ceasefire…Let us prepare to bring Yemenis to the negotiating table,” he said. Saudi Arabia and its Gulf allies are trying to Paint their aggression on Yemen as Pure sectarian , which they think that can benefit them , but till now they have totally failed as even Pakistan People have even turn down their request to Jump in the Hot flames of War , which they have ignited , but are now afraid of its consequences , which can definitely cost them their Monarchies , and Dictatorships , While Iran has Played a Positive Role in the Whole scenario , By Politically and Morally backing the Victim of War , the Yemeni People , and have called for Role of UN and OIC in dilution of the Situation , and bringing the concerned Parties across the Table to Peacefully resolve the Intense situation , created by the Unilateral Airstrikes of Saudi Led Coalition on the Yemeni People. Against this backdrop of escalating tensions, the first medical supplies have started arriving in Aden: the medical aid group Doctors Without Borders said they have made it to some of the city’s hospitals. It said a boat carrying 2.5 tonnes of medicine had docked in Aden, the first shipment the group has delivered to the city since the fighting there escalated. For its part, the International Committee of the Red Cross (ICRC) said that a surgical team also arrived by boat on Wednesday in Aden. “It’s nearly catastrophic,” Marie Claire Feghali, ICRC’s spokesperson in Yemen, told Reuters news agency. Earlier in the day, residents of al-Siddah district in central Yemen said they woke to find al-Qaeda flags flying over local government offices, Reuters news agency reported. They said a group of al-Qaeda gunmen led by a local commander known as Ma’mour al-Hakem, took over the district at night. 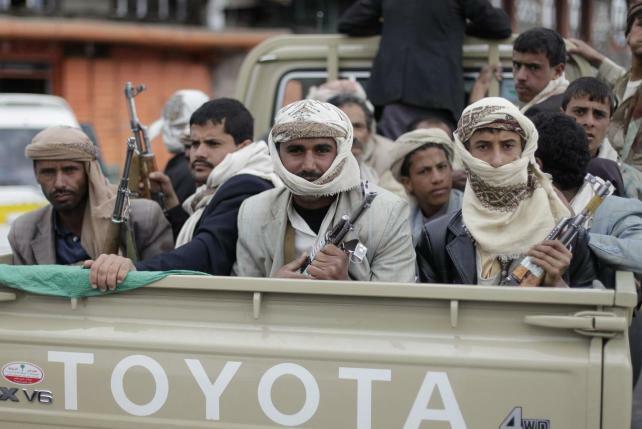 Residents said the Houthis, who had been in control of the town for more than two months, retreated without a fight. The United States defence secretary has said that the escalated conflict has provided al-Qaeda with an “opportunity” to gain new territory in Yemen. This is despite confirmation from the US that it is expediting advanced arms shipments to Saudi Arabia. This is a well known fact now that the Terrorist Group Like Al Qaeda , ISIS , Taliban , Boko Haram , Al Shabab , and other Wahabi Ideological groups ,which are created by the US CIA Plan and are financed by Saudi Monarchy , always become active in Places where the US and Saudi Govt wants to Penetrate their influence , as recorded by the Recent History ,whether it may be Pakistan , Afghanistan, Iraq, Syria , Libya, or any other country, while as the Intelligence agencies have already alerted that Shia Houthi Movement is gaining Momentum , and if not countered then they might loose their influence in Yemen , so Al Qaeda was already launched in Yemen , so they have the License to Kill any body in Yemen on the pretext of fighting Al Qaeda Terrorists , and for the same reason US CIA was conducting Drone attacks against their enemies on the Pretext of Hitting the Al Qaeda Terrorist Group. This entry was posted in Jafria, Middle East and tagged Economy, Shia Houthis, Yemen. Bookmark the permalink.